Irish Eyes offers players the ultimate Irish experience as they travel to Ireland, the world of leprechauns and genies where they will track down the rainbow so they can find the pot of gold that lies at the end. As they do that, they will enjoy all of the aspects of the Irish culture as they spin the reels. All what they have to do is place their bet and start spinning the reels so they can watch the marvelous Irish themed symbols as they spin and form winning combos so they can get paid, whether through the line rewards or through the special icons and bonus rounds. 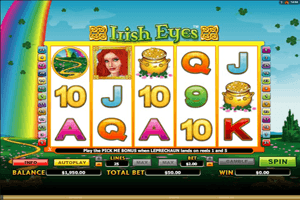 Play Irish Eyes Slot here. The icons that appear on the reels include an Irish redhead, a leprechaun, a rainbow, green fields, a pot of gold and card symbols. Players can check out the line payouts that the game offers by clicking on the Paytable button that is found under the reels. It will also show players the different bonus and special icons it has. For example, the beautiful Irish redhead girl is the scatter icon that can give players generous scattered rewards and it can also trigger 12 free spins for players when 3 of her appear on the reels. The Leprechaun is the wild icon that is also the highest paying symbol. There is also the Pick ME bonus which is activated when the wild Leprechaun appears on the 1st and the last reel at the same time in any position.